As whisky has always been associated with Scotland, Siberian pelmeni (ravioli) with Russia and roast beef and Yorkshire pudding with England, piti is Sheki’s signature dish. Although there is no secret to the preparation of this lamb stew, it does taste especially appetizing when eaten in Sheki. The key to real piti flavour lies in the earthenware pots in which it’s cooked. There is a street in Sheki called Potters’ Street, where potters and their families used to live. Once, some 50 families on the street made clay pots, but the number of artisans has fallen dramatically in the last 50 to 70 years and now only a few people continue the tradition. Nowadays, pottery is the preserve of the Mammadov family. For the head of the family, 43-year-old Ahad Mammadov, it’s a matter of principle to save his craft by passing it on to his nephew and son. Mammadov’s clay pots play a huge role in the life of Sheki people, as they are used to cook piti. 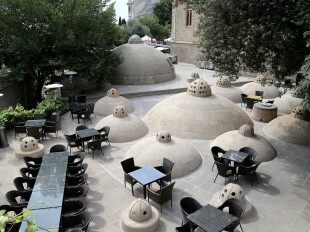 The Azerbaijani name for the pots is dopu. Dopu come in different shapes, but the most widespread is the small pot which holds a single serving. It takes the hands of a master craftsman to shape a dopu. Key to the process is good quality clay that used to be brought from the Sheki mountains. 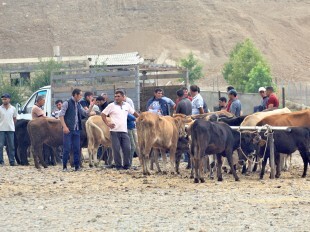 Ahad Mammadov told Visions that for 10 years now they have been prohibited from using Sheki clay, so they have to bring it from neighbouring Qabala region. There are about 70 sorts of clay; the most suitable is homogeneous clay without any little stones. Even the tiniest stones can cause a problem when the pots are fired. 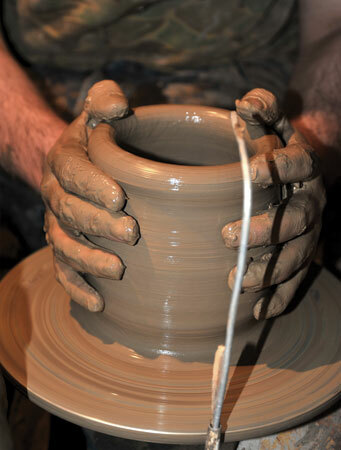 The clay should be mixed the right way with water; it should be left to soften for a week. I’m not alone in this difficult business. My nephew Rahman helps me a lot. Mainly, he assists me in shaping the pots. He does it very well and will probably take over from me one day. He usually makes about 50 pots in a day, so he is a real master. After Rahman has shaped the dopu, they are left to dry for some time before being fired. As Ahad told us, this is the most difficult part in the pottery process. 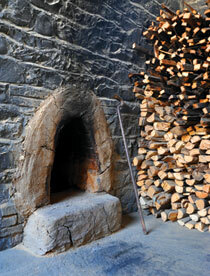 The pots are fired in kilns for at least 48 hours. The sound of a real dopu is like metal. The finishing touch to the pots is hydration. They are filled with water and left to stand for a while to absorb the moisture. Then they are ready for piti. Ahad is not the first potter in his family. His father, grandfather and great-grandfather before him all made dopu. Shoyub Mammadov, his father, was a famous potter in Sheki and a member of the Union of Artists. Ahad’s son, who he hopes will continue this craft, was named after his grandfather. We are the only potters here in Sheki. My nephew Rahman and I spend our days in the workshop. Together we process the clay, shape pots, make stocks of firewood and fire the pots. It is not an easy task, but we love our craft. It not only feeds us. We are also responsible for the survival of the craft in Sheki. I’m so happy, because we are making the magic pots needed for piti, Sheki’s favourite dish. Piti is traditionally a workers’ dish, local people say. There is even a belief that one portion of piti is enough to see a worker through the whole day; it is a very satisfying and, at the same time, inexpensive lunch. It contains a lot of calories and very filling ingredients. The main ingredient is lamb, rich in proteins and fat. The use of only fresh meat and the fat from the distinctive tails of Azerbaijani sheep give the dish its special flavour. 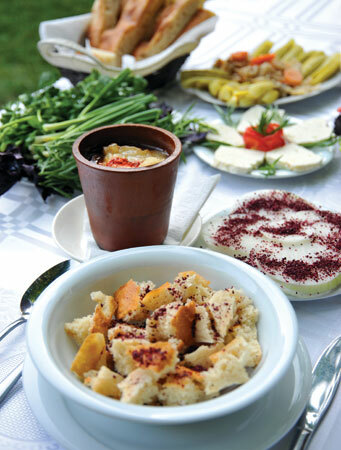 Azerbaijan’s lamb has a fine taste thanks to the country’s rich pasture. Winter or summer, Sheki people love to eat piti which is a staple in all the local restaurants. Fuad Ibragimkhalilov works in one of Sheki’s best known restaurants, the Caravanserai. He is a piti master chef and knows full well the secret of good meat. Before becoming a chef he used to work as a butcher, so he is expert at selecting the best cuts for the dish. Before the Visions team had lunch at the Caravanserai, Fuad gave us a master class in cooking piti. Beneath the cool shady trees, our appetites were whetted as we watched the master at work. 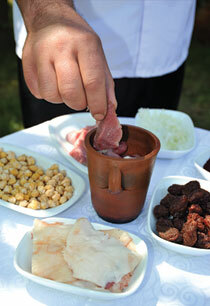 Besides lamb, the other ingredients used by Fuad were chickpeas, onion, tail fat, dried plums, chestnuts and spices. First, he put into the pot some chickpeas that had already been soaked in water. Then he placed pieces of lamb on top of the chickpeas and added salt. He filled the pot with water and added a pinch of saffron. The tail fat was placed on top of the dopu. Ideally, the dopu should simmer on a low heat for eight to nine hours. As soon as the water came to the boil, Fuad removed the scum, added finely chopped onion and left the dopu to continue simmering. Just before removing the piti from the heat, Fuad added to each pot a dried plum and chestnut, which had already been boiled separately. And the magic piti pot was ready! As the piti was cooking, we explored every corner of the Caravanserai. A hotel, restaurant and tea house all in one, the Caravanserai is a must-see for all visitors to Sheki. The old buildings will take you back to medieval times when merchants and their weary caravans found rest in this picturesque spot. The old stone rooms now have modern conveniences but retain the atmosphere of olden days. A fountain stands in the courtyard of the hotel and there is a traditional teahouse nearby. Tea is served from a samovar only. So visitors spend at least an hour enjoying the aromatic tea and range of delicious sweets. A hookah is also available. It’s so relaxing that we didn’t even notice how time passed. Soon Fuad called us to dinner which was served in the Caravanserai’s garden. Pots of fragrant piti were awaiting us. But what’s this? we asked as we saw something red on a plate near the dopu. It’s onion in sumac, a special snack to accompany piti, Fuad told us. 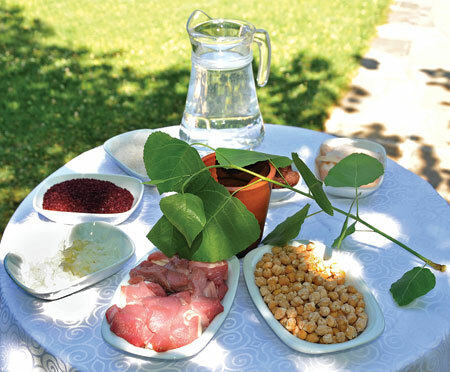 The coarsely sliced onion rings had been dipped in sumac, a tangy red powder made from the bark of the barberry bush. Sheki people are right to call piti two dishes in one. It really is rich and filling. First comes the soup. Break up some dry bread in a bowl and pour the liquid out of your dopu over the bread. When you have enjoyed the soup with sumac and onion, spoon the remaining contents of the dopu into the bowl. Mash together the tender meat, chickpeas, chestnuts and plums and eat with more sumac and onion. Delicious! Hot tea is the ideal drink to follow piti. Our tea was served with Sheki baklava, another signature Sheki delicacy which we will tell you about in detail in our next issue. Place the soaked chickpeas in the pot, then the lamb. Add salt. Fill the pot with water. Add the saffron, then place the sheep tail fat on top. Put the lid on the pot. Bring the pot slowly to the boil and skim off the scum that forms on the surface. Add the sliced onion and leave to simmer on a very low flame for at least two hours (ideally six to eight hours). Pierce the chestnuts. Cover with water in a pan and bring to the boil. Simmer for 5 minutes. Remove from the water and shell. If you are using several chestnuts, don’t take them all out of the water at once, as they are difficult to shell when dry. Add the cooked chestnuts and dried plums to the pot some 10 minutes before serving.